A couple of weeks ago I was brewing a batch of my Sorachi Patersbier in my garage. The door was down to keep most of the frigged air from biting me, and as I was sitting there in a sunbeam watching the steam from my boil, I thought, “I love Making Beer!” The more I thought about it, the more I started to realize I love making beer more then drinking it. Probably not what most people expect to hear from a “beer geek” but it’s true. Many beer geeks I know talk about the latest beers, how they drink, or what new beer is around the corner. I dream of how to take malts, hops, yeast and combine them to make a new experience. What is it about making a beer that I love so much? While I knew I loved brewing, it took me a while to figure out why. It’s about the process. For me, the process isn’t just the recipe, doing the mash, boiling the wort, or adding the hops, it’s the whole evolution of the beer. It is coming up with the idea for my next beer, whether it is a basic Schwatrzbier, a Brown Ale with Tequila soaked Vanilla Beans, or my Chocolate Peanut Butter Porter. Coming up with a great idea for a beer is fun, but for me crafting a recipe is where the fun really begins. Putting together the right ingredients in the right proportions is a challenge that continues to push me and improve my knowledge of ingredients. Brew day goes with out saying, it’s a great way for me to break out of my regular routine and focus on something that I’m passionate about. But what is it about the brewing process, and the way things go together that drives me? 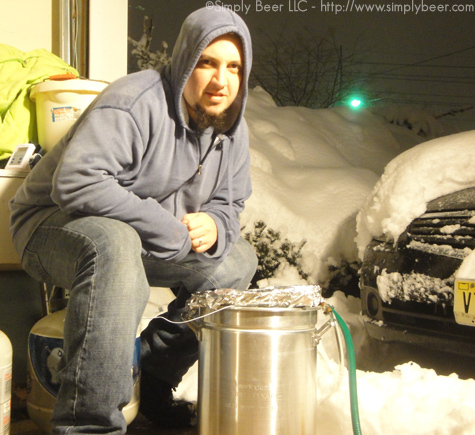 Homebrewing, at its most basic level, is very simple and one of things that makes it so great. I like to take that foundation and see how far I can tweak it. Beyond a simple recipe, brewing beer is a fragile system and one that truly fascinates me. Along with the actual ingredients, there are so many variables that change and can alter the flavors in your beer, mash temps, hops alpha, fermentation temps, and sanitation. Figuring out how all these interactions can help your beer and is another challenge I look forward to every time I make beer. Loving the process is not enough. Many people love the process of brewing beer, but at what point does the scale for the love of brewing beer tip away from the love of drinking beer? For me it happened when I realized that I was no longer trying to find, buy, or trade for all the great new beers being released every week. Instead my thoughts began to fall back towards making beer. When I’m in the grocery store and I inevitably start looking at grocery items to see if they would work in a batch of beer. When I’m drinking a beer I start comparing it my own, how to make my beer better. Even when I’m working I find myself thinking about what equipment I could use to make my set up more efficient and where I can eliminate variables to be more consistent. Don’t get me wrong, I still love drinking beer, but drinking beer is part of my inspiration to brew beer. The other part for me is watching people’s reaction of my beer. Regardless of what people may say you can almost always tell what they think by their initial reaction. That, to me, is the sign that I should keep on brewing. If anyone needs to find me I’ll be out in my garage making beer. As I home brewer I follow your blog regularly but never comment. However I couldn’t agree more. I just said the other night while encouraging some friends to keep drinking my homebrew that my second favorite sound is a keg floating. They were befuddled but it means a new creation is going in or i need to get brewing something new. Thanks Chris. I served 5 cornys of my homebrews this weekend to a bunch of people and it was great to see them enjoying the beers, some of them not realizing it was homebrew and where could they buy it.